I've been away from the blog a bit, working on several projects. Lord Willing new posts should appear within the next day or two. Dr. White, on yesterday's special edition of the Dividing Line, provided answers and some cross examination of one of the critics of an article I wrote a while ago on the worship of Mary in Catholicism. Dr. White did an excellent job, I write here simply to briefly summarize two of the relevant points, for those listeners who, like the caller, were confused. This critique of Catholicism is an external critique. We are not saying that Roman Catholicism today says, "We worship Mary." Instead, we are saying that actions and attitudes expressed by Benedict XVI and others amount to worship: they are worship. Shakespeare wrote that a rose by any other name would smell as sweet. This critique of Roman Catholicism is based on the actual events and expressed opinions of the members of Roman Catholicism identified. It is not based on reading their minds. We are not suggesting that the average person at the Vatican kneels in front of a statue and says to themselves, "Time to worship Mary." No, instead, we are saying that the expressed attitudes towards Mary (such as asking Mary to turn their hearts or the hearts of others) are inappropriate - that they amount to worship of Mary. Our goal here is to warn folks that what they are doing is wrong. We are not trying to suggest that "Joe Roman Catholic" knows that he is worshiping Mary when he recites the Ave Maria, when he bows to a statue of Mary, and when he otherwise venarates Mary and deparated believers. I happened to come across a Reformed Website from Singapore, presented in the Indonesian language (link to site). For those whose first language is Indonesian, this resource may provide some further assistance. UPDATE: Corrected "Malay" to "Indonesian" thanks to helpful comments (see the comment box). It is important to see the silver lining in clouds. c) America was spared from having a woman Vice President (although America has an even-more-firmly-entrenched female Speaker of the House). I realize that may not be what you want to hear, but that's what you need to hear right now. Those words of God connect and resonate in your heart, for you know that they are true. You cannot escape them, so hear them, fear your Maker, repent, and believe the gospel to the saving of your soul. Americans today have a number of unpleasant voting options that I've already discussed. Hopefully, by the time any Americans who read this blog are reading this (if not, they may enjoy this link), they will have already voted. For them, and for the the rest of the world, perhaps something a little less spooky, but still American will provide a bit of relief from the political dilemma. 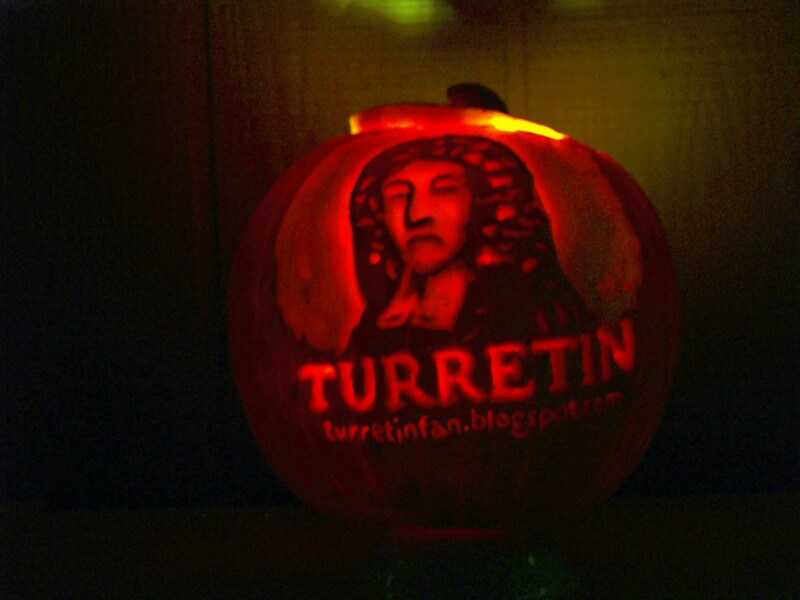 TurretinFan does not endorse using any of these images in worship, does not endorse the holiday of "Halloween," and is not out of his gourd (ha) - he just wants to get his mind off of American politics for a bit. Some forger has posted a comment on GreenBaggins using my nick. (link to fake comment) I would appreciate it if GreenBaggins would delete that comment, as it was not written by me and does not represent my position. I don't seem to be able to locate any email address for GreenBaggins, so I'm posting this here, until I can track them down. UPDATE: Wow! That was fast. My hat is off to GB for acting so quickly on the matter! Incidentally, to the forger (whoever he may be), be advised that your unethical behavior is something for which you will have to give an account one day. If God is perfectly good, all knowing, and all powerful, then the issue of why there is so much suffering in the world requires an explanation. The reason is that a perfectly good God would be opposed to it, an all-powerful God would be capable of eliminating it, and an all-knowing God would know what to do about it. So the extent of intense suffering in the world means for the theist that either God is not powerful enough to eliminate it, or God does not care enough to eliminate it, or God is just not smart enough to know what to do about it. The stubborn fact of intense suffering in the world means that something is wrong with God’s ability, or his goodness, or his knowledge. I consider this as close to an empirical refutation of Christianity as is possible. a) God is perfectly good, he is all knowing, and he is all powerful. b) God is also perfectly just. c) There is suffering the world, and there is happiness in the world. d) The answer to why there is suffering is easy: there is sin and God is just. e) The more puzzling thing is why there is any happiness in the world. f) The reason is that God is not only perfectly good and perfectly just, but also merciful. JL claims: "The reason is that a perfectly good God would be opposed to it, an all-powerful God would be capable of eliminating it, and an all-knowing God would know what to do about it." JL doesn't know what "good" is. That's the problem. JL seems to think that the goodness of God is measured by what God does for him! How foolish! God is the creator and we are the creature. We exist for His pleasure, not the other way around. When sin is punished by suffering and death, that is God being good. JL may not like it, but what JL likes is not the standard of good. JL claims: "So the extent of intense suffering in the world means for the theist that either God is not powerful enough to eliminate it, or God does not care enough to eliminate it, or God is just not smart enough to know what to do about it." JL's dichotomy (well, "di-" is not technically correct prefix because he provides more than two options) is false. God is powerful enough to eliminate all suffering and to eliminate all happiness. God is smart enough to know what to do to eliminate either suffering or happiness. The reason for God not eliminating either of these is not an insufficient degree of care. God does care what goes on in the world, and what goes on is precisely what He has decreed. But again, notice the premise in JL's reasoning: if God does not care to eliminate JL's suffering, God does not care enough. This characterization makes sense only from the backwards viewpoint of anthropocentrism: a man-centered view of the universe. JL claims: "The stubborn fact of intense suffering in the world means that something is wrong with God’s ability, or his goodness, or his knowledge." As noted above, however, the problem is actually with JL's apparent view that "goodness" is measured by man's standard, not God's standard. JL seems to overlook the possibility that something is wrong with the standards he's using, and instead points a crooked finger at God. Furthermore, since JL overlooks the problem of sin, JL hasn't seen that the real difficulty is not suffering, but happiness. For more, see the interesting video from Pastor Voddie Baucham that I previously embedded (link). Let me be clear, there may be some for whom Loftus' internal critique would work. There are some for whom their conception of God is as anthropocentric as Loftus'. I hope, dear readers, that you are not among them. If you are, I would exhort you to obtain a copy of Dr. White's "The Potter's Freedom," and read it. In that book, Dr. White powerfully explains the fact of God's sovereignty. It's available at the Alpha and Omega Ministries bookstore (link) and probably a number of other venues.